THE FISH THAT ALMOST GOT AWAY! A Cartoon Fish is an awesome thing to draw. But you have caught him with your pencil. This draw a cartoon fish step by step lesson is a great for kids or adults. This fun fish drawing is colorful and happy. 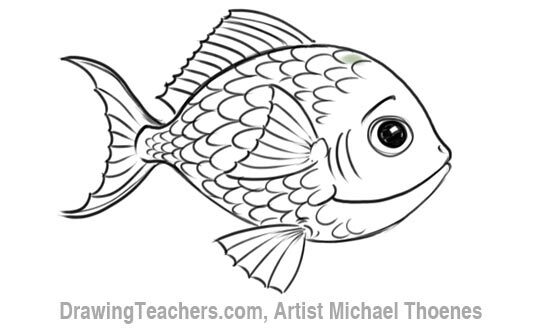 You could draw a whole school of fish like this one in a fish tank drawing or an underwater scene or painting. You could draw a picture where there is a fishing boat on top of the water and along line coming down to a hook in front of his cartoon fish. You could even put a cartoon worm on the hook. Use your imagination and have fun drawing. 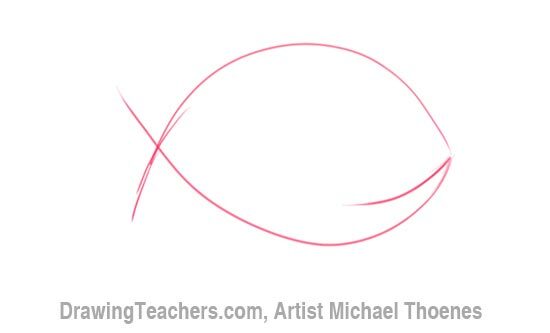 Begin your cartoon fish drawing with two long curves crossing where the tail will be. Add a shorter curve for the fish's mouth. Add a large circle for the eye, some triangular fins on the side and bottom and a larger fin on the back that reaches almost to the tail fin. Refine the shape of the fish's outline creating a stubby nose. Draw a pupil for the eyes. Add some curves for gills. 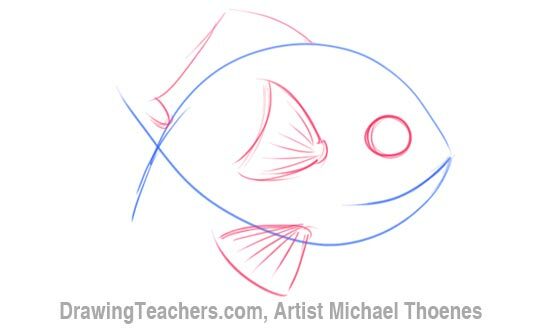 Complete the outline of the tail and add ridges to the fins. 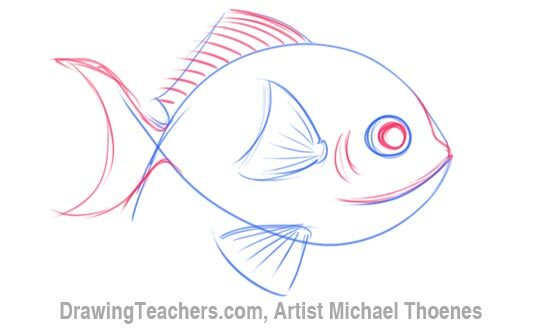 Refine the fins and fill in the eye leaving a white spot or a highlight. Sketch some curved lines to indicate the roundness of the body. 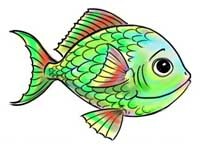 Space them fairly evenly as they will help you to draw the fish scales. Sketch curves for the scale. Stagger each row by half a scale. Ink your fish drawing with pen or marker. 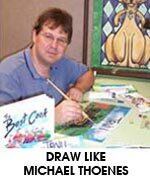 Clean up your sketch in preparation for coloring or painting. Lay down your base color for the body. Light Blue. Lay down the base color for the fins and overlay and blend it with the body color. Yellow. Overlay and blend accent colors. Purple. Overlay the strongest accent colors. In this case red. 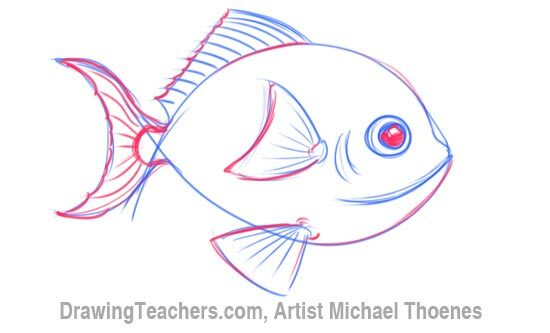 "How to Draw a Cartoon Fish!"